The rise of the ultrabook has led to good-enough laptops that actually are just that — good enough. From the MacBook Air to the Asus Zenbook, light-but-powerful(enough) laptops have been around for a few years now. Though they do not muscle through intensive tasks like their larger brethren, they handle the majority of common computing tasks with aplomb. Alongside the ultrabook, tablets have created a new market of devices even lighter and more portable than ultrabooks, with the trade-off being that they don’t run the same software. You can still work on an ultrabook; a tablet is designed more with entertainment in mind. Microsoft has been trying to merge the two concepts into one device with their Surface Pro line, and the first two models met with some success. I reviewed the original Surface Pro about six months ago, and found the concept compelling but the execution lacking. Among my chief complaints were the less-than-accurate pen and the fact that the keyboard covers were too small to be immediately used by a touch-typist like myself. The Surface Pro’s successor, the Surface Pro 2, greatly improved battery life while incrementally improving performance, but did not address my chief complaints about the device. In June, Microsoft announced the Surface Pro 3, a larger, yet somehow lighter upgrade that uses a different pen technology to improve accuracy. The basic design of the Surface Pro has been altered slightly; it’s thinner and lighter that previous models, though it is wider and taller due to its bigger screen. The black magnesium frame of the previous models has been recolored a light grey, and the one or two-step hinge for the built-in stand has been replaced with a completely adjustable one. The Wacom pen hardware has been swapped with a less sensitive but more accurate solution created by N-Trig. The improvement that really sold me on the new Surface Pro, however, is that the larger screen size led to a larger type cover, finally providing the width to support a nearly full-size keyboard. Microsoft took great pains to improve the keyboard for the Surface Pro 3. On top of its larger size, it also features a second magnetic strip that attaches to the bottom bezel of the display, lifting the keyboard to a slight angle. It makes the keyboard more stable, though it does nothing to eliminate the light flexing the keyboard does as one types. I’ve written a few thousand words on its larger keyboard, and have found it passable. It’s not my favorite thing to type on, but is completely functional. There are a few keys that don’t quite line up as you’d expect, but you can expect to touch-type with the speed and accuracy of any other keyboard. The Surface Pro 3 from another angle. At the bottom of the type cover is a small trackpad, which I am not a fan of. It tracks accurately enough, and after disabling tap-to-click, I found myself working quite well with it. However, it is incredibly small. This is an unavoidable compromise; there isn’t much more room on the cover after including a full-size keyboard. Thankfully, the Surface Pro 3 features two alternate pointing methods: a capacitive touchscreen and pressure-sensitive stylus. Capacitive touch is great for tablet-style apps, but by its nature is not as precise or fast as a mouse or stylus. Still, it’s great when reading or viewing movies. It’s okay for web browsing, but getting pinpoint accuracy — say, when editing text or crafting fine details in a drawing — is not really possible. The N-Trig pen, while not the preferred stylus of digital artists, appears to be more accurate across the entire face of the tablet than its predecessor. There is a bit more lag in its response than the Wacom solution used in previous models, but I did not find it to be a problem. The pen is also less sensitive to pressure than previous models, sometimes requiring more force than I would like. The tip of my Surface pen is already showing signs of wear, though replacing the little nibs should not be difficult or expensive. It’s not perfect, but I like it. The most noticeable change to the Surface Pro 3 is its larger screen. With a more reading-friendly 3:2 aspect ratio, it is sharp and bright. Both full frame and widescreen video appear with letterboxing, but it is slight and largely unnoticeable. The Surface Pro 3 has completely supplanted my iPad for watching video at work, in bed, or on the go. The stereo speakers are surprisingly loud for their size, and produce sound comparable with competing tablets. Like the previous Surface Pro tablets, you can use Mini Displayport to output video to an external monitor or projector. 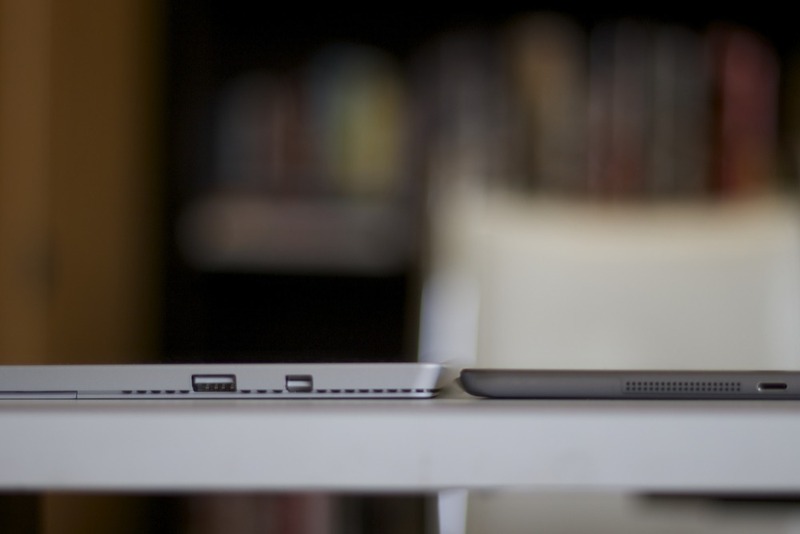 A side view of the Surface Pro 3 and iPad Air. 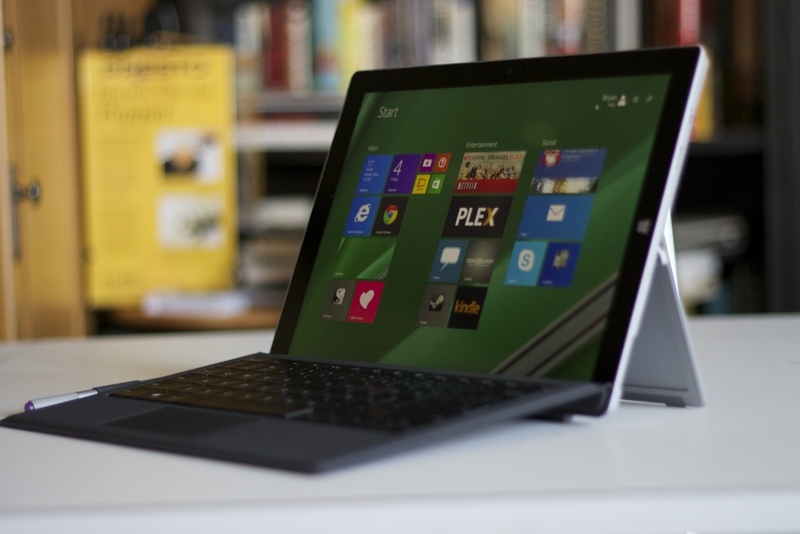 Despite its larger display, the Surface Pro 3 readily lasts through the average work day. If you are only using it sporadically, it can probably last more than one. Actual battery life will obviously depend on how hard you push the device; increasing the brightness or running processor-intensive software will result in shorter running times between charges. The Surface Pro 3 gets around eight hours of use with a full charge, which is not bad. It’s not outstanding, either, with an iPad getting ten and some models of Macbook Air pulling an unbelievable twelve, but it’s still acceptable. For the sake of comparison, the 13-inch MacBook Air weighs over a pound more than the Surface Pro 3, and that weight is largely from the battery. Since the Surface Pro 3 must also function as a tablet, I consider reduced battery life to be a reasonable compromise. There are a few mars on the Surface Pro 3, though. It only has one USB port, so you’ll need to have a hub handy if you want to use multiple devices. There are still a few hiccups in the software, as well. I often have trouble waking the device from sleep mode, sometimes WiFi drops, and I’ve also found myself unable to remove the orientation lock from time to time. Hopefully the software issues will iron themselves out with a few updates. None of the issues occur often enough to cause any real trouble, and it’s nothing a quick restart can’t fix. The material used for the keyboard cover attracts every fleck of dust and dirt around, which is annoying, but so far it has always wiped clean for me. Finally, how well the Surface Pro 3 will work on your lap largely depends on how long your legs are. If you are shorter than average, like me, it may be a tight squeeze. The more I use it, the more I feel that the Surface Pro 3 is what the original Surface Pro should have been. I actually find myself wishing it was Apple who had taken initiative on this concept, because I am so entrenched in their ecosystem. I don’t think that can be held against Microsoft, though, as nearly every application I use on the Mac can be found on Windows or has an equivalent. The tablet side of things is a little less rosy, with the Windows App Store paling in comparison to Apple and Google’s offerings, but many major apps are now available there. I am very happy with the new Surface Pro 3. I had no misgivings about returning the first model in just a few days, and I have no misgivings about hanging on to this model for the foreseeable future. It’s a little expensive, but it is incredibly flexible and can actually do double-duty as a laptop and a tablet. 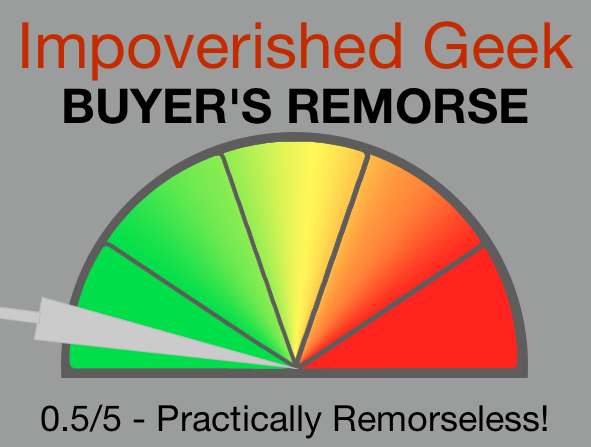 The Surface Pro 3 gets a 0.5 on the Impoverished Geek Scale of Buyer’s Remorse.